Roger of St. Albans. 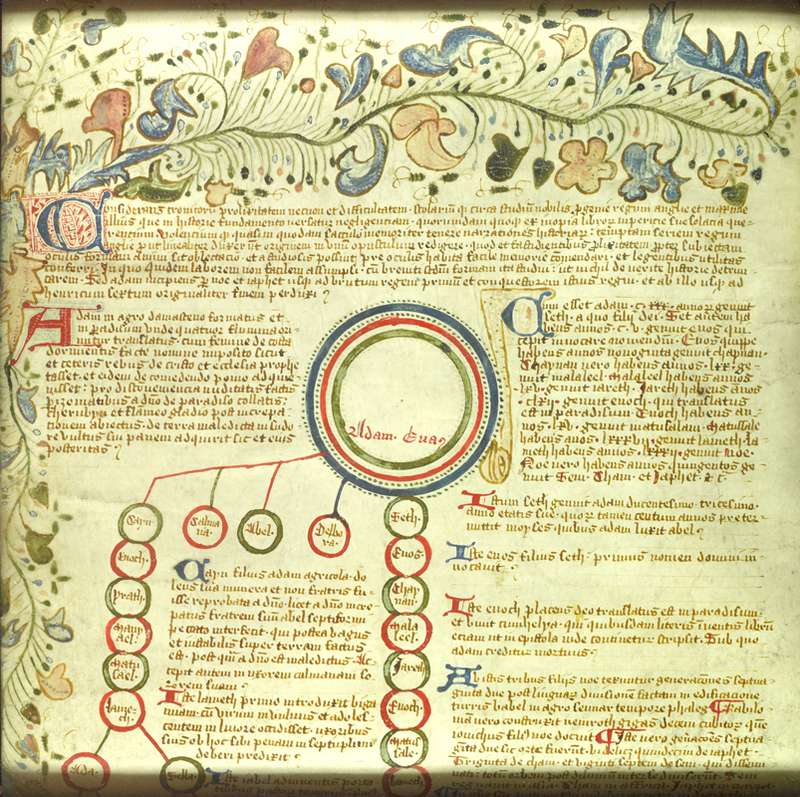 Genealogical roll, in Latin. 15th-century manuscript on a vellum roll 20 feet 5 inches x 12 inches (612.8 x 30 cm. ), written in England. Of the many English roll chronicles extant from the mid-15th century, this one by the Carmelite friar Roger of St. Albans was one of the most popular. It exists in at least six other manuscripts and in two versions. Originally the chronicle ended in 1453; however, some manuscripts, like Lehigh's, continued to the time of King Edward IV, terminating just prior to his marriage in 1465. As the chronicle accounts for time from Adam through the kings of England and included such major biblical events as Noah's flood and the coming of Christ, the purpose of the manuscripts was primarily educational. The displayed section is the beginning of the roll, framed within a vegetal border. Also illustrated is the start of the ornate genealogical tree, which begins with Adam of the Old Testament and includes contemporary figures. Acquired by Lehigh in 1955, the gift of Mr. Robert B. Honeyman, Jr.